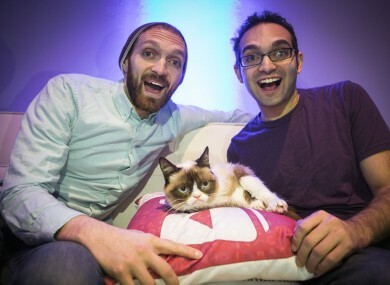 Rafi and Benny Fine are the owners of the Fine Brothers channel, best known for its series of 'react' videos. THE OWNERS OF one of the biggest YouTube channels has apologised and reversed their plans to trademark and licence ‘reaction’ videos. The Fine Brothers channel is best known for its ‘reaction’ series including ‘Kids react’, ‘Teens react’ and ‘Elders react’, but they were heavily criticised when it announced a new programme called React World. The idea was that anyone who wanted to produce a reaction video similar to theirs would have to license the format from the Fine Brothers company. The video where its founders, brothers Benny and Rafi Fine, announced the move was later taken down but said it was “not only a huge step for our company, but for the entire global media industry”. The rest of YouTube, however, didn’t agree. Since the concept of react videos is so ubiquitous, and the language used by the Fine Bros was so vague, it caused many of the site’s creators and fans to heavily criticise the decision. The channel lost hundreds of thousands of subscribers, having started at 14.3 million subscribers before the announcement before falling to 13.75 million. Another video was posted by the brothers explaining the concept further but it was also taken down. The brothers apologised on Medium for the decision and said they would be rescinding all of its ‘react’ trademark and applications and releasing all of their channel’s Content ID claims. “We’re here to apologise” they said. ”We realised we built a system that could easily be used for wrong. We are fixing that”. “This has been a hard week” the brothers said. Email “YouTube stars apologise for trying to trademark 'reaction' videos”. Feedback on “YouTube stars apologise for trying to trademark 'reaction' videos”.